Previously, I’ve used three.js to create 3D terrain maps in the browser (1, 2, 3, 4, 5, 6). It worked great for smaller areas, but three.js doesn’t have built-in support for tiling and advanced LOD algorithms needed to render large terrains. So I decided to take Cesium for a spin. Compared to the dying Google Earth plugin, it's quite complicated to get started with Cesium. The source code is well documented and the live coding Sandcastle is great, but there is a lack of tutorials and my development slows down when I have to deal with a lot of math. 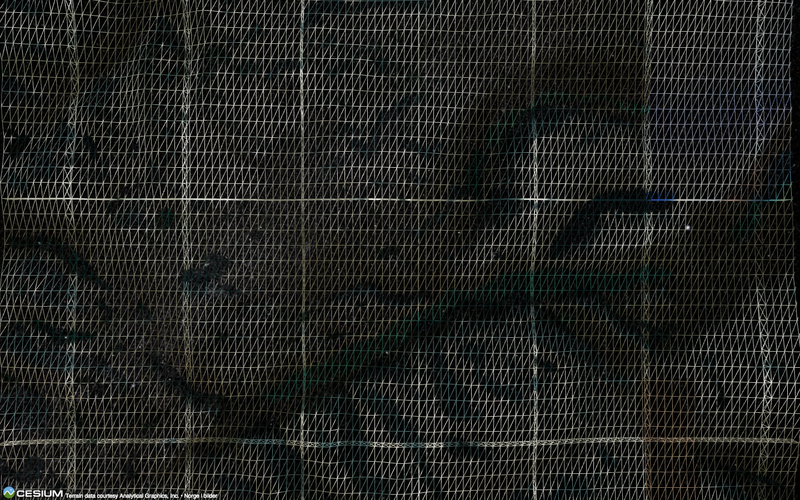 That said, I was able to create an app streaming my own terrain and imagery with a few lines of code. There is also WebGL Earth, a wrapper around Cesium giving you an API similar to well-known Leaflet. I expect to see more functions or wrappers to make stuff like camera positioning easier in the future. How can you add your own terrain data to Cesium? The tiled heightmap format is similar to the one I used for three.js. Each tile contains 65 x 65 height values, which overlap their neighbors at their edges to create a seamless terrain. 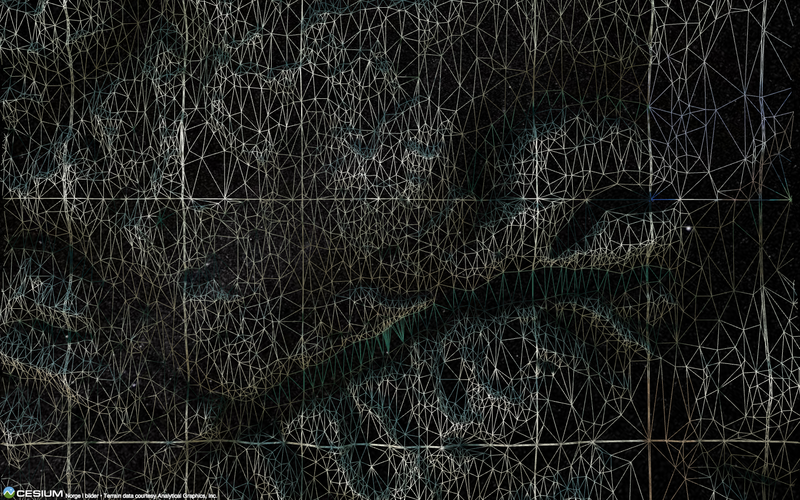 Cesium translates the heightmap tiles into a uniform triangle mesh, as I did in three.js. The downside of this format is the uniform grid, you use the same amount of data to represent both flat and hilly terrain. The regular terrain mesh made from heightmap tiles. The quantized-mesh format follows the same tile structure as heightmap tiles, but each tile is better optimised for large-scale terrain rendering. Instead of creating a dense, uniform triangle mesh in the browser, an irregular triangle mesh is pre-rendered for each tile. It's a better representation of the landscape, having less detail in flat areas while increasing the density in steep terrain. The mesh terrain is also more memory efficient and renders faster. The irregular terrain mesh from quantized-mesh tiles. Larger triangles have less height variation. Unfortunately, I haven't found any open source tools to create tiles in the quantized-mesh format - please notify me if you know how to do it! You can generate heightmap tiles with Cesium Terrain Builder, a great command-line utility by Homme Zwaagstra at the GeoData Institute, University of Southampton. I'm using the same elevation data as I did for my three.js maps, but this time in full 10 meter resolution. I'm just clipping the data to my focus area (Jotunheimen) using EPSG:4326, the World Geodetic System (WGS 84). First I had to add a missing top level tile that Cesium was expecting. Then I was ready to go! 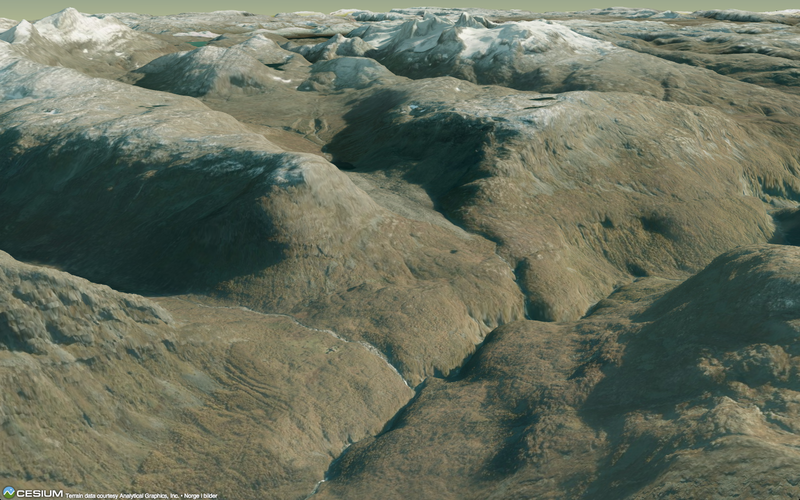 Beautiful terrain rendered with 10 m elevation data from the Norwegian Mapping Authority. Those who know Jotunheimen, will notice Skogadalsbøen by the river and Stølsnostind and Falketind surrounded by glaciers in the background. 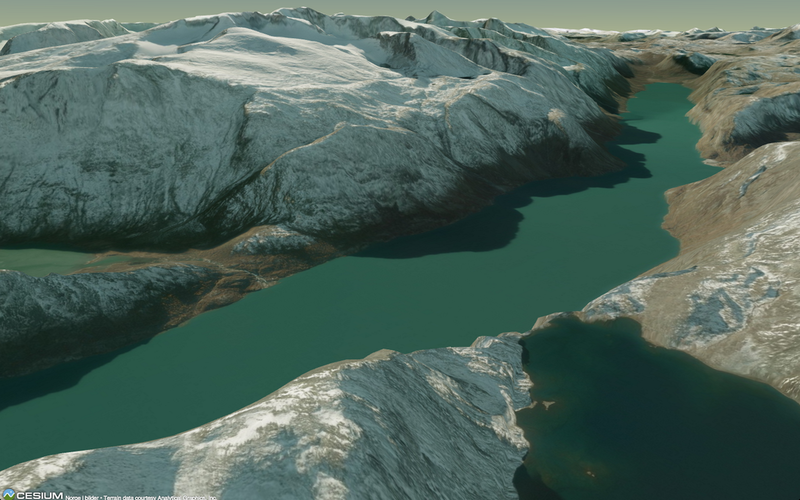 The terrain is a bit blocky (see the mount Falketind to the left), but I'm not sure if this is happening in Cesium Terrain Builder or Cesium itself. The quantized-mesh tiles from AGI gives a better result. I'm not able so show an interactive version, as I'm using detailed aerial imagery from "Norge i bilder", which are not publicly available. Great blog post, I can't wait to find some more time to try it by myself too. Awesome stuff! I definitely want to try this out, and you make it easy to get started. "Triangle generates exact Delaunay triangulations, constrained Delaunay triangulations, conforming Delaunay triangulations, Voronoi diagrams, and high-quality triangular meshes." Triangle does a good stuff, fast and robust triangulation. IMHO, for the generation of TIN, the problem is more the selection of the points to triangulate than the triangulation itself. OpenMesh provides good simplification routines that could be use here. it'possible in theory develop a plugin for qgis with cesium for terrain 3d viewer? A bit more information about the quantized-mesh format is provided in the Cesium forum. I hoping for an open source solution soon. I have been trying this for two days with no success unfortunately. Terrain tiles were generated with ctb-tile tool in Docker. Somehow your solution (adding last two lines into .htaccess file) doesn't work for me. I am trying this on Windows machine using WAMP Server and right now I have no idea left. Another way : I use geoserver to server my geotiff with WCS 2.0.1. I wrote a WCSTerrainProvider which use a GeotiffParser in order to decode each tile and transforme the tile into an Heightmap. Quite slow but easy to use ans standard. I will publish soon a new version on github of the WCSTerrainProvider. This new version use IndexedDB to store localy the Heighmap. An error occurred in "CesiumTerrainProvider": Failed to obtain image tile X: 1 Y: 0 Level: 1. An error occurred in "CesiumTerrainProvider": Failed to obtain image tile X: 0 Y: 0 Level: 1. I think I am not saving layer.json file in the cesium directory properly. For the missing top layer tile, I am using https://cesiumjs.org/tilesets/terrain/smallterrain/0/0/0.terrain. Please let me know where I am wrong. I have the same issue with : An error occurred in "CesiumTerrainProvider": Failed to obtain terrain tile X: 0 Y: 0 Level: 0. I have missing tiles and layer.json file. Have you figure it out what colud be the problem? 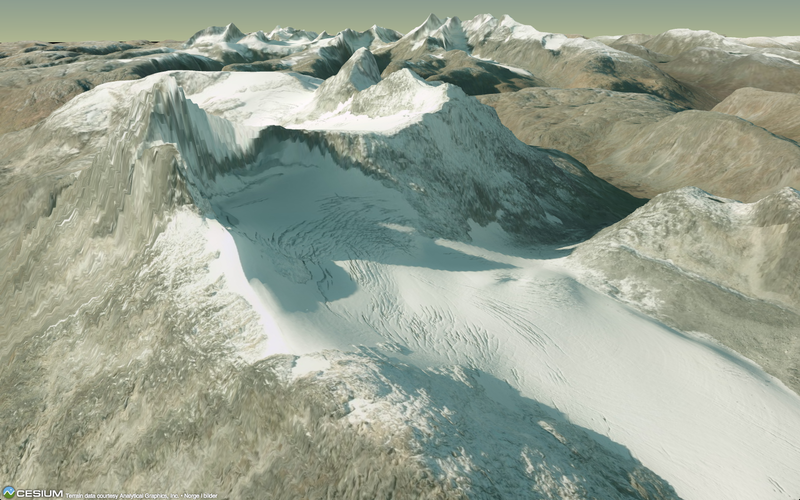 thanks to this great article managed to create my own terrain for Cesium! how you generate tiles with vertex normals and get those beautiful shadows on terrain? thank you for your great work regarding the terrain issue in Cesium. An error occurred in "CesiumTerrainProvider": Failed to obtain terrain tile X: 0 Y: 0 Level: 0. An error occurred in "CesiumTerrainProvider": Failed to obtain terrain tile X: 1 Y: 0 Level: 0. Please share with us the thing how can we fix the error.